A mod to provide more road signs at various road intersections so you don't need to refer to your map so often. The 2 sign sets near Dragon Bridge have been changed to injected records to share with Cutting Room Floor. Moved a lightpost out of the way of one of the Manny's lightposts in Lanterns of Skyrim SE. Moved the signpost south of Steamcrag Camp over a bit to avoid a conflict with one of the lantern post mods. Ever travel the roads and wonder how it is people find their way? Have you noticed that the roads in many places simply don't have signs that tell you where you can go while traveling them? 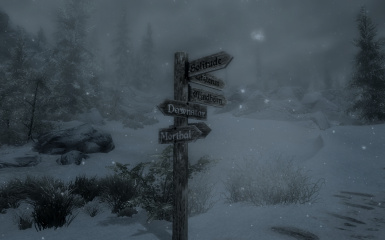 If you were a foreign visitor to Skyrim, you've got no hope of being able to travel the intricate road network without stopping to read your map every so often, even when you're at a major intersection. Worry no more! 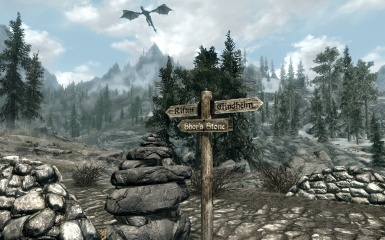 While you weren't looking, The Empire sent out its trusty civil engineers (surely Skyrim has some) and they set about marking the roads to better assist travelers in finding their way. This mod's aim is fairly simple. Road signs have been placed at several major intersections that were either lacking signs, or didn't have enough signs to indicate the full extent of where you could travel on a road. In some cases, the smaller towns and villages aren't even mentioned - despite Bethesda having created signs for them! Others that were pointed the wrong way or had the wrong city being represented have been fixed as well. I highly recommend Roadsigns Redone as a texture replacer! For an alternative road sign retexture, try Hi-Res Legible Road Signs. A good complementary mod: Hold Border Banners. Drop the Point The Way.esp, Point The Way.bsa, and Point The Way - Textures.bsa files into your Data folder. Remove the Point The Way.esp, Point The Way.bsa, and Point The Way - Textures.bsa files from your Data folder. No permanent changes are made by this mod. Load order should not matter terribly much as most of these are going to be away from anything important. Works with any road sign texture replacers you're using. 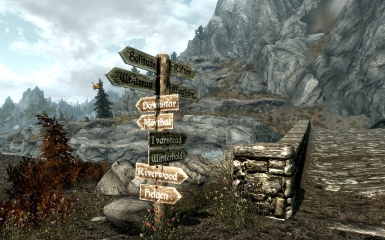 These are strictly vanilla road signs that have been placed, with the exception of the sign for Kynesgrove. Shares injected records for full compatibility with Cutting Room Floor. Hana - Road sign mesh and base texture for Kynesgrove.